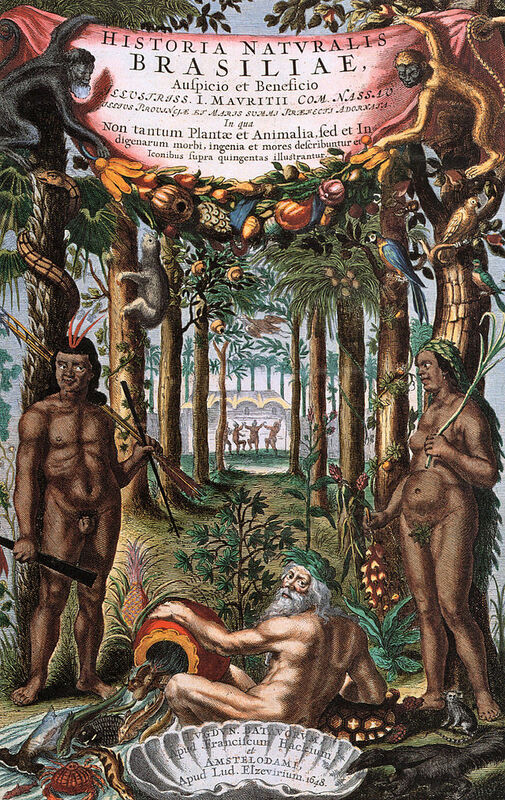 Historia Naturalis Brasiliae is the first scientific work on the natural history of Brasil, published in 1648. It was the authoritative text on the subject for one-and-a-half century. Now we are trying to locate every remaining copy of the book worldwide. So far we have found approximately 250 copies. Who has got one more? When Johan Maurits was appointed governor of Dutch Brazil in 1636, he soon commissioned a number of scientists and artists to explore and capture the geography and natural history of the colony. Among the scientists that took part in the expedition were German naturalist Georg Marcgrave (1610-1644) and the Dutch physician Willem Piso (1611-1678). Their findings would later be edited by Johannes de Laet and published as Historia Naturalis Brasiliae in 1648. The ‘HNB‘ has had a huge impact on the knowledge about tropical flora and fauna, the perception of Brazil and natural history in general. It influenced and inspired naturalists such as Ole Worm, Maria Sibylla Merian and Carl Linnaeus and remained the principle text on Northeastern South America until the 19th century. Even though the book has been studied from various angles, we know very little about the material history of the book. There are no reliable estimates of the print run. Furthermore, we assume that the book was disseminated over Europe instantly, but in fact information about the early owners is scarce. Finally, the trajectory of the books in the following centuries can tell us a lot about changing cultural and scientific perspectives. The copy census is a unique method to understand the history of books as a social and cultural phenomenon. It locates copies, maps the paths of specific copies through time, and may help to explain how ideas were transmitted through print. So far, we have located approximately 250 copies of HNB worldwide and collected data on the shelf marks, collection histories, coloring, provenances, marginalia, bindings, decorations and other forms of material evidence of most of these copies. We are now in the final month before our census will be published. Obviously, we would be delighted with any last minute additions to the list. If your library holds a copy and you have not yet been in touch with us (Alex Alsemgeest and Jeroen Bos), or if you have more detailed information than you could provide us before, please let us know. Not only will this be very helpful to us, it assures that your copy will be included in a list that will hopefully serve researchers of the HNB for some time to come. Copy 1: Shelf mark: 5G 5. Binding: Contemporary brown leather, panel design with blind tooling on front cover, spine with 5 raised bands. Coloration: Black-and-white. Complete: Yes. Provenance: Library stamp: Bibliothèque Musée Teyler Harlem. Copy 2: Shelf mark: 113 AB21300. Binding: Eighteenth century green morocco, rebacked gilt decorated spine with floral motifs and six raised bands, all edges gilt, marbled endpapers. Coloration: Black-and-white. Complete: Yes. Provenance: Bookplate: Ex Bibliotheca Com: Thomae Cajetani de Węgry Węgierski [Tomasz Kajetan Węgierski] (1756-1787 | Polish poet). Booksellers’ plate: Rey et Gravier, quai des Augustins, no. 55, Paris. Manuscript annotation: Dr. Walter Channing, April 11, 1840 (1786-1876 | American physician and professor of medicine; sent as a gift to Amos Binney, includes a two page handwritten letter to accompany the donation. Manuscript annotation: Amos Binney (1803-1847 | American physician and malacologist). Bookplate: Boston Society of Natural History, from the library of Dr. Amos Binney, deposited by mrs. M.A. Binney. Manuscript annotation: Col. Büch. Acquired by Boudewijn Büch (1948-2002 | Dutch author and book collector) from Kistner and Ackerman (Nürnberg/München | Antiquarian bookdealers) in January 1993. Update 14/06/2018: Several new copies could be added to the census, and many more could be updated thanks to the help of Marieke van Delft of the National Library of the Netherlands, CERL and many specialists and curators around the world who responded to our call. In the list below, recent additions are preceded by an asterisk. Furthermore, it has been pointed out that the copies of the colleges at Cambridge and Oxford should be listed separately and not placed under the heading of the university libraries. We will correct that in the final version. Update 10/07/2018: A double call by Liesbeth Missel of Wageningen University & Research Library at the European Botanical and Horticultural Libraries group and the Council on Botanical and Horticultural Libraries resulted in a handful copies from Scotland, Germany and the United States that were not yet recorded.